Welcome to the RIT Tech Crew website. Here you can find information about the crew, what we do, and check the status of a project with us. Select one of the options below to get started. 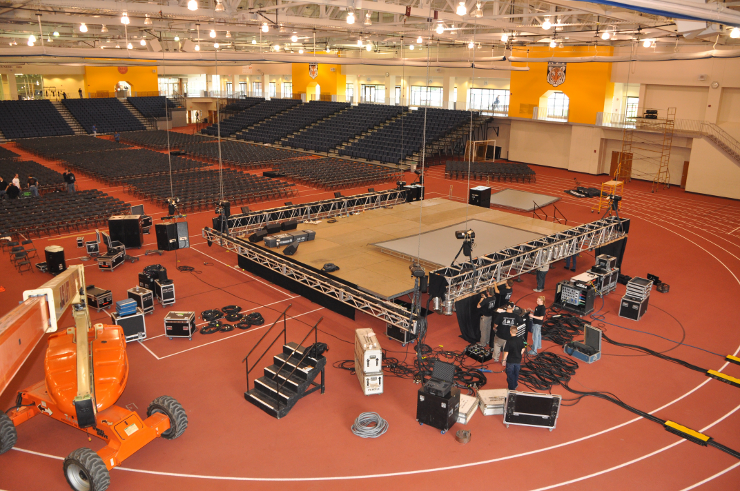 RIT Tech Crew is a technical production department on campus that provides sound reinforcement, lighting design, power distribution, staging and rigging. Tech Crew works closely with local production and rental companies in order to provide a multitude of services to our clients. Tech Crew’s parent department is the Center for Campus Life. Its primary mission is to support on-campus student activities and events. These events include, but are not limited to, dance parties, lectures, concerts and Commencement. Tech Crew is comprised entirely of student employees and managed by two RIT staff members. We employ around 60 students regularly and hire about 10 – 20 students at the start of every academic year. If you are looking for information about contracting Tech Crew's services or about registering an event on campus, please contact Event Registration behind the Info Desk in the Campus Center (CPC). Our Business Office is located in the basement of the Student Alumni Union (SAU), room 04-A426. If you have any questions or inquiries about Tech Crew services, feel free to contact us by phone at (585) 475-2257 or by email at tecccl@rit.edu. Business Office Hours vary from semester to semester depending on student coordinator schedule and will be posted each semester on the office door.